Carl started training at Chicago S&C in July 2017 and has been wonderfully consistent in his barbell training, rarely missing a training session. 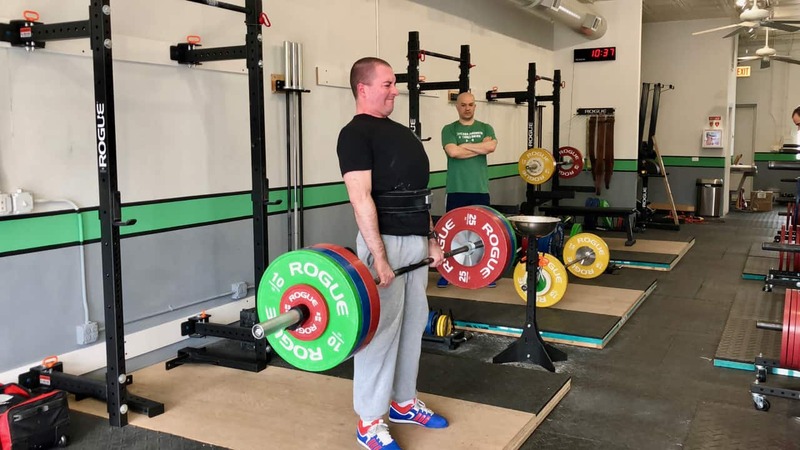 He usually trains in the evenings and on weekends so if you train regularly at Chicago S&C, odds are that you have had the good fortune of training with both Carl and his wife, Nicole, who is also a member of the gym. Carl is a calm, disciplined, positive presence in the gym. He never complains, gets his work done, and approaches his training from a deliberate, rational perspective, which is no surprise given that he programs computers for a living. He has many varied interests so between sets, you may hear him talk about a new board game that just came out, public choice theory, or his upcoming trip to Japan. Hello, I’m 34 and I program computers. I studied Japanese in college and I just bought a house and got married to my wonderful wife, Nicole, last year. I have one brother who does not lift, though I’m working on him. I have very little history of a concentrated exercise regimen. I did some strength training, aerobics, and even capoeira (an Afro-Brazilian martial art that combines elements of dance, acrobatics, and music) for a couple many more sedentary years. I occasionally did a semi-active sport like windsurfing or sailing, but those things do far more for balance, dexterity, and endurance than they do for strength. How did you find out about Chicago S&C and what was the catalyst to get you to contact us and come on your first day? When I was working at Groupon, I met Coach Dave when he joined our engineering team. He introduced me and others to Starting Strength and encouraged everybody who asked to get the book and start barbell training. I took him up on an offer of a private introduction at his home gym, and made a habit of it. The first couple of weeks were rough. Every half-inch crack in the sidewalk risked totally collapsing my gait and climbing down stairs, I looked like a geriatric. But it quickly got better. My biggest strength moment was about 6 months into training. My wife, Nicole, and I went to Ikea and stuffed our little Scion so full of furniture I had to move the seat up to the point I almost beeped the horn by breathing. When we got home, I put a 40-lb shelf assembly on my back and climbed three flights of stairs to our apartment and then did it 4 more times with the other shelves. That’s when I knew that being strong is more than a hobby and competition; It’s a gateway to a healthier, happier life. Strength training teaches grit and adaptation. It requires grit to come to the gym and train, even when you don’t want to, and discipline yourself to the suffering. You go to the gym knowing you’re going to suffer and you leave having done so. Through this cycle, your body adapts, and you simply increase the weight each time. Through this you learn that your body can adapt to hardship and become harder itself, and so too can your mind. Barbell training is meditation for your meat. Decide what outcome you want and pursue that outcome directly and with discipline. If your goal is to open that gateway to a happier, healthier life, then get under a barbell and start meditating.